One of my colleagues and dear friends recommended that I should read this book. I’m so glad she did. I absolutely love it! 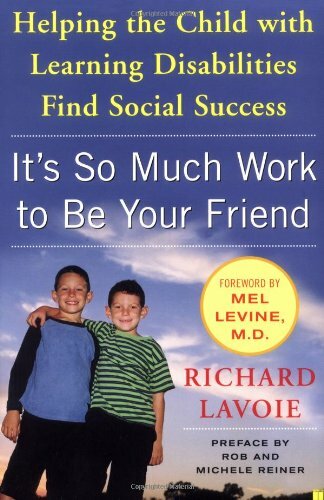 The central focus of this book is that “children with learning problems tend to struggle with social relationships”. The author gives practical advice and everyday ways you can help your child improve their social functioning. He recognizes that due to children’s learning disabilities, they may not be able to pick up on the social cues like other kids, so they need more direct instruction and guidance to learn how to interact with others and be a good friend. The book begins by discussing how different learning disabilities impact the development of social skills. It’s really helpful to start with this as a frame of reference when working with kids who struggle academically and socially. “My brother uses my Walkman CD” - CLK. “He uses it in the shower” - that would be LD! He gives great ideas about helping kids who have trouble socially at school. He discusses ways to manage bullying situations and creating a support system. I find that this is one of the overlooked ways of helping a child who is bullied. Obviously, you want to have the bullying stop, but that is only part of the solution. Helping the child to create a support system is a great long-term way to help them deal with bullying and increase their social circle. The next section of the book discusses how to help your child make connections in the community in a way that is helpful and useful. He states that children “with social skill deficits learn most efficiently in natural environments”, but that you also need to do some prep with the adults involved beforehand. Parents will need to get involved to seek out good potential friends for your child. Here are some of my ideas for places you can look to find and make new connections. One of my favorite techniques that he discusses is the social autopsy. You take a real-life situation where there was a social misstep, talk through what happened with the child in a supportive and non-judgemental way to figure out what caused the social error, and discuss what could have been done differently to prevent the social faux pas. It’s so much more effective to use a real-life issue and talk it through with kids to see what they could have done to change the outcome. This book is rich in practical advice to help parents support their children in making social connections and starting and maintaining friendships. I have so many highlighted, starred and underlined passages because I think this book is perfect for kids who have a learning disability and are struggling in the social arena. I highly recommend it! Read it and let me know your thoughts! !